The heating system in your property is extremely important – especially during the colder months of the year. When there are issues with the heating, it can mean plenty of cold days and nights. Not only is this uncomfortable for everyone in the property, but it’s also potentially dangerous. Being exposed to cold temperatures for too long could lead to many health issues. The furnace is a vital part of your central heating system. Essentially, it’s where water and air are heated to get sent throughout your property. When you have issues with this, it tends to mean you could be without hot water or any central heating. Typically, problems will occur when you have not looked after your furnace correctly. This is where we come in, as our team can conduct thorough furnace maintenance. With this service, we take a look inside your furnace to assess the shape it’s in. If we notice there are lingering issues, then we’ll see to it that they’re dealt with right away. By conducting regular furnace maintenance, you will improve the efficiency and longevity of your heating system. There will be fewer faults, and you can actually improve your energy bill by having a furnace that heats up your property more effectively. If your furnace hasn’t been looked at for a while, then make sure you give us a call today. We’ll be there as soon as possible to carry out extensive maintenance checks. Our company also carries out extensive heating repairs. Aside from poor maintenance, issues with your furnace can be caused by many different things. A lot of the time, the age of the furnace is what’s to blame. 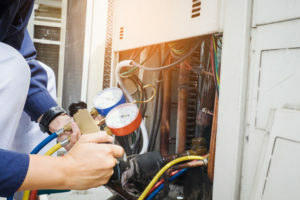 If you are noticing weird noises coming from your furnace or unusual smells, those can be signs that your heating system is experiencing some problems. No matter what, there’s no furnace repair that we can’t do. Whether it’s a tiny problem that can be solved in minutes or a more substantial one that requires extensive work; we’re more than qualified to do the best job possible. Furnace repair is essential if you want your heating system to function accordingly. Faults tend to linger and cause more severe issues that can be potentially hazardous. Remember, most furnaces are gas or oil fueled, both of which are flammable. Therefore, it makes sense to call in the professionals as soon as you notice a fault so we can handle it safely for you. Alongside our furnace repair service, we also provide furnace replacements. When our team comes in to take care of a repair, we may see that it’s far more serious than you initially expected. As such, we know it would be a waste of our time, and a waste of your money, if we went ahead with the repair. So, we give you a second option; furnace replacement. We will replace a damaged furnace with a newer model, giving you a much better heating system. Clients tend to ask, “How long does a furnace last?” This question can be tricky to answer. Furnaces can last up to 15-20 years if maintained properly but most of the time, after 10 years, your furnace is not as energy efficient and you may notice your electricity bill has been higher than normal. Sometimes replacing your furnace earlier may be the best option and will cost you less money in the long run. We strongly suggest you contact us today to see if you’re looking for heating installation. This allows us to review your existing one, and fit a replacement model as soon as possible. The longer you leave it, the less chance there is of getting a replacement in time for the coldest months of the year. Our company is proud to offer years of experience in this field. In fact, our technicians are true HVAC experts, adept at diagnosing and servicing all makes and models of HVAC equipment. What’s more, we are proud to back up our products with written warranties and guarantees that are simply without equal —including a pledge to address any issues you face with your unit within six months of its routine maintenance. We stand by our work and want our customers to know that they can trust us to do right by them. Trustworthy & Reliable: Our team has experience carrying out furnace repairs, maintenance, and replacements throughout the area. All of our clients are left with smiles on their faces as we solve their problems as quickly as possible. We pride ourselves on being a business you can trust with such an important task. Cost-Effective: All of our services are extremely cost-effective. We only charge what we deem is fair, and you don’t have to pay until after the job is finished. 24/7/365: We operate a service that never sleeps! No matter the time of day, our team is ready to pick up the phone and answer your call. We’re here when you need us most. Commercial & Residential: Regardless of whether you need commercial or residential heating services, we will handle them for you. Give us a call if you’re looking for the most reliable heating services around. Our lines are open 24/7, and we will help you with all of your heating/furnace needs.